I am big sucker for breakfast and I believe that it is a very important meal. 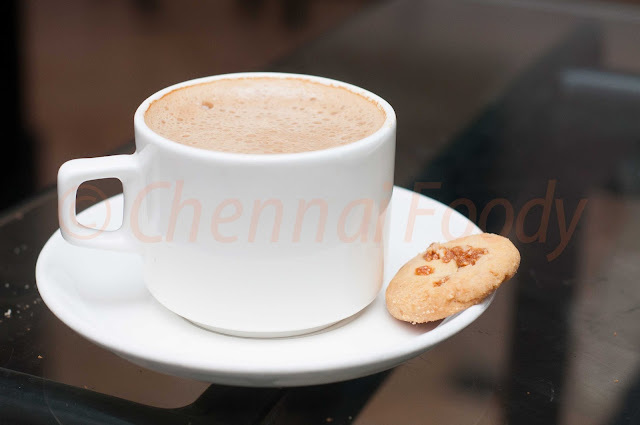 A lot of my wellness gyaan talks about breakfast and its importance, but unfortunately, except for the Stay-includes-breakfast deals at hotels, somehow fancy-breakfast does not seem to be a very profitable business in Chennai or most parts of India, at least in cities where there is no Au Bon Pain. The Sundays have the brunch, which is a different ball game altogether, but there are lots of places which thrive on breakfast dishes throughout the day - purely on idly, vada, sambar, pongal types, namely Saravana Bhavan and now the newly opened Krishnavilasam, which I am yet to visit. But back to non-Indian breakfast and your choices are quite limited, but when the craving for eating a good breakfast outside of home on a Sunday (and I know I am one of the few who craves for that), the only option that came to mind was Parfait 3. A few months back, I had a very good breakfast at BBQ Chicken, but they closed down. So, last Sunday, we were at Parfait, just to stretch out and eat some breakfast! We arrived at 1030! We had just two orders - the largest breakfast combo priced at Rs 225 (starts from 85) and a banana pancake! 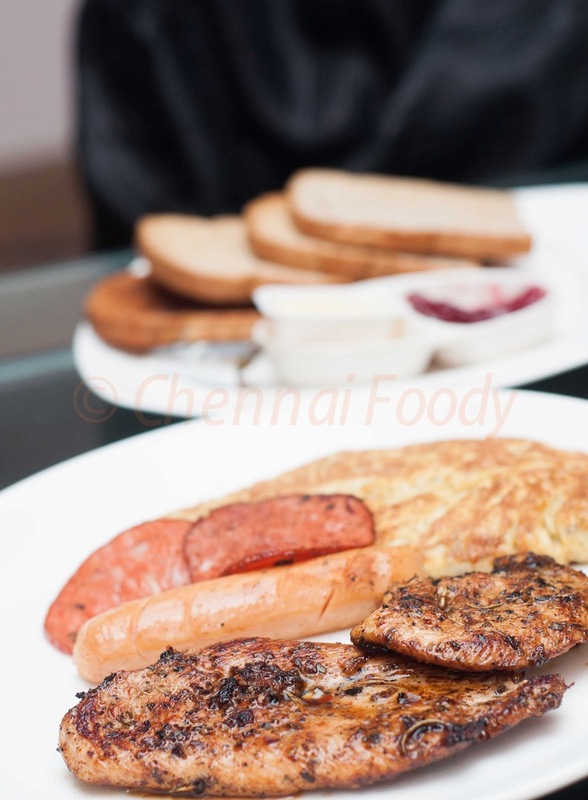 The combo had 4 slices of toast, slightly burnt (I asked for it that way), eggs to order and we asked for cheese masala omelette, 2 chicken sausages, 3 slices of chicken salami, butter, jam, a chicken breast made to order and coffee with a cookie. The chicken breast had lots of oregano and was simple, but tasty and the rest were what you would normally expect - nothing more, nothing less. 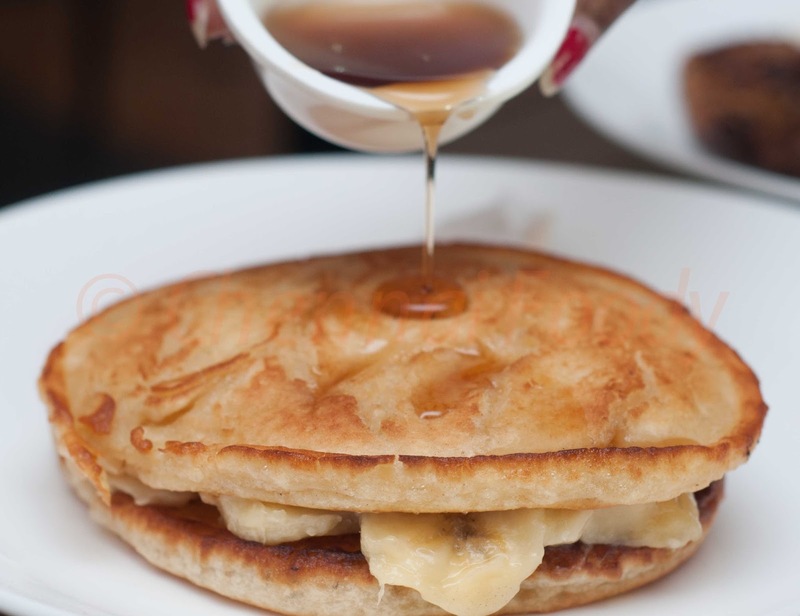 I have had banana pancake here before and they are usually very good, but that day, the pancakes were thicker and so slightly undercooked! We then picked up some meringues, which I thought were excellent, packed a very soft and rather thin focaccia and chocolate bread sticks for home and their bakery is worth a visit. There were two other tables occupied, one with a young man who ordered the same breakfast combo and was reading, while the other was a couple, so I was not the only one crazy enough to get breakfast on a Sunday! Normally, on Sundays, I sleep through breakfast times and that is a different story, but on all workdays, I get a very similar breakfast done at home! So, it is very similar to making idly at home, but going to HSB or Sangeetha for idly once in a while. The total bill, including the take away was Rs. 380. There are many Parfait 3's in Chennai and I went to their Kilpauk outlet. They are open from 11 am to 11 pm on weekdays and from 8 am onwards on weekends. I don't think an IHOP type place will ever come to Chennai!